Casey Anthony: What would you say if you met her? "If a duck stands still, you can catch him by the bill...honk, honk." That'd give her something to think about! Or... two words that would be guaranteed to send her into a tizzy: "Yer mother!" "Did you hear about that Knox girl? I can't wait to buy her book." We need a 'Like' button!!!!! Can't you just see Slore's face????!!!!!! What did analyzing the Casey Anthony case mean to local lawyers who logged hundreds of hours on the air? I’m asking the legal analysts what stood out, how the public reacted and how the case affected their lives. First up: Bill Sheaffer, the oft-seen and oft-quoted legal analyst for WFTV-Channel 9. I heard a rumor that Sunday is "Punch the Slore" day. Not just this Sunday, but every Sunday. I'm still rather numb at the outcome of this whole case but every once in awhile I'm startled when I realize that she really did get away with murder. Obviously I'm always aware of this fact, but sometimes it just slaps me in the face out of nowhere. The only thing that makes me feel better is realizing the miserable life she is going to live now that she's physically free. At this point, she has to have realized that her quality of life was a lot better while she was locked up. What we really need here is a smiley showing the slore being hanged, drawn and quartered. I can relate entirely...it hits me out of nowhere that she did get away with murder. I still cannot watch video or even see pictures from when the verdict was read. Come on sweety.......lets turn that frown upside down! 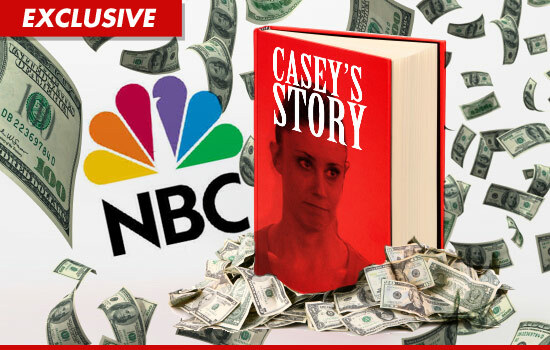 The honchos at NBC -- the C stands for crafty -- think they figured out a way to snag an interview with Casey Anthony without paying a red cent, and make her a wealthy woman at the same time. We've learned an NBC news producer has reached out to people in the literary world, trying to score a book deal for Anthony. The producer has contacted literary agents and others, telling them if he scored a book deal for Casey, she'd give the network a 1-hour, primetime special ... portions of which would also run on "Today." The producer makes it clear -- NBC couldn't pay a cent for the interview. But he is gung-ho about the book deal, even representing that Casey wants up front money. Jose Baez, Casey's lawyer, tells TMZ ... he has full knowledge of the producer's efforts, but says, "I'm not involved in that process. I did not entice him to do it." Baez was quick to add, "Casey is not ready to do an interview." We tried multiple times to get a comment from NBC -- so far, no luck. The identities of the jurors who found Casey Anthony not guilty of murdering her young daughter will be made public tomorrow—and they’re bracing for retribution from furious “Justice for Caylee” cyberwarriors. Diane Dimond reports. Now the stage is set for all of the jurors’ identities to be released to the public under Florida’s sweeping Public Records Law. And that has many—from Chief Judge Belvin Perry, who presided over the Anthony trial, to members of the jury—afraid the “Justice for Caylee” forces will launch a vigilante campaign against them. Ordinarily in the Sunshine State, jurors’ names are automatically released to the public soon after the verdict. But as Judge Perry wrote after the Anthony decision, “It is clear, the jurors in this case face the possibility of substantial injury if their names are immediately made public.” The judge allowed the media a hearing on the immediate release of the names but he then took the extraordinary step of declaring a three-month “cooling-off period” to let the angry anti-jury passions die down. That hiatus expires Oct. 25. Since the verdict, some of the most active cyberwarriors have focused on making sure Casey Anthony never makes money by selling her story. Whenever a rumor spreads that a television network or book publisher is considering making a deal with her, the calls for letter-writing campaigns and network and sponsor boycotts begin anew. The morning programs on NBC and ABC have been the bidders most often mentioned for an Anthony interview. In follow-up Facebook notes, Briley wrote that the deal had fallen apart and that NBC was ready to pony up “right around 2 million dollars” on its own. Oh, please, no one is going to harm the jurors. This is just theatrics and drama. This is the same BS that KC and her team used during the trial. I agree. Will they have to answer for the acts of unjustice? I assuredly hope so, but not in a physical way. ORLANDO, Fla. -- Judge Belvin Perry could release the names of the jurors in the Casey Anthony murder trial as early as Tuesday. Three jurors who acquitted Anthony, 25, in July have already discussed the case. One of them, Jennifer Ford, said there was a lack of hard evidence. Ford said if she and her fellow jurors could have convicted Anthony solely based on feelings and emotions, they would have. Meanwhile, video of Anthony being deposed in a civil lawsuit could be released later this week. Do you think the names of jurors in the Casey Anthony murder trial should be released to the public? I am pleased to announce that I will be working with a law firm on a part time, of counsel basis. The firm handels Domestic, Civil and Criminal matters. The web site is http://www.troumandwallsh.com/ if I can be of any assistance to anyone in the area. This is the pic the mask should of been made for halloween.. Page created in 6.161 seconds with 22 queries.